I love immersive theatre. It grants you agency within a dramatic world, allowing you to manipulate fiction, as well as letting stage designers run wild and create a new reality. From Punchdrunk's epic The Drowned Man to Lucien Bourjeily's terrifying 60 Minutes in Damascus, immersive theatre has ranked among some of my favourite nights out. So naturally I was eagerly anticipating The Hotel, billed as "a new immersive experience unlike any other." Immersive my foot! I've been in paddling pools more immersive than this. What it actually is is two fifty minute long plays with a bit of connective tissue in between. Rather than experiencing an immersive world you'll spend the vast majority of your time parked in a seat quietly watching conventional theatre. The conceit of the night is that we're guests in a hotel. We hang about in a lobby area for a short while, then we're ushered into one of two rooms to watch a one act play. I'm slightly hamstrung in this review by the fact that the programme asks that the details of these shows remain secret for future guests. But while I didn't like the show very much, I'll respect their wishes and be as vague as possible. The first room I entered contained a romantic domestic drama by a 19th century European playwright. Bluntly: it sucked. The actors delivered the wordy lines as if it was the first time they'd seen the script, less reacting to the other performer and more waiting for their cue to speak. It's an awful feeling when you realise almost instantly that this not only isn't very good, it's not going to improve either. For excruciating minute after excruciating minute it shuffled painfully towards a damp squib emotional climax. Worse, we could hear the muffled sounds of what sounded like a much more interesting play through the walls. That turned out to be the second of the night's plays, a somewhat livelier piece by a 16th century playwright. After the drudgery of the first room my expectations weren't exactly sky high, but thankfully it was a huge improvement. It still wasn't exactly stunning theatre, but at least this one had some interesting lighting, energetic staging and striking performances. Particularly eye-catching was the demonic physicality of John Askew, stalking the stage like a human spider, the sharp lighting catching the angles of his evocative features. Fun as this was to watch (at one point a woman was being strangled on top of my foot!) it only barely scratched the surface of the source material. Still, I'll take what I can get. Given the presence of two titans of theatre in the rooms it feels a bit odd to say that the absolute highlight was the light comedy taking place in between the shows. Stanley Eldridge as the hotel manager holds an improvised management seminar. He's got a stuffy Partridgian air to him as he blithely takes us through buzzwords while fighting constant interruptions. With his quick and hilarious improvisational skills I'd have much preferred to spend the night with him, but alas this part appears to be there to kill time while the audience are shuttled between rooms. 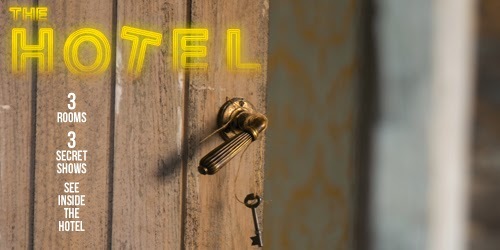 The idea of a hotel with a different play taking place in each room is theoretically promising. If the plays had been somehow thematically connected or allowed the audience to move between each as they please maybe - maybe - this would have been worthy. As it is it's just a double bill of theatre, one of which is okay and the other outright awful. If you're expecting anything remotely like The Drowned Man, You Me Bum Bum Train or Hotel Medea you're going to be very disappointed. Frankly, advertising this as immersive theatre is borderline dishonest. The Hotel is at 47/49 Tanner Street until 19th October 2014. Tickets here.